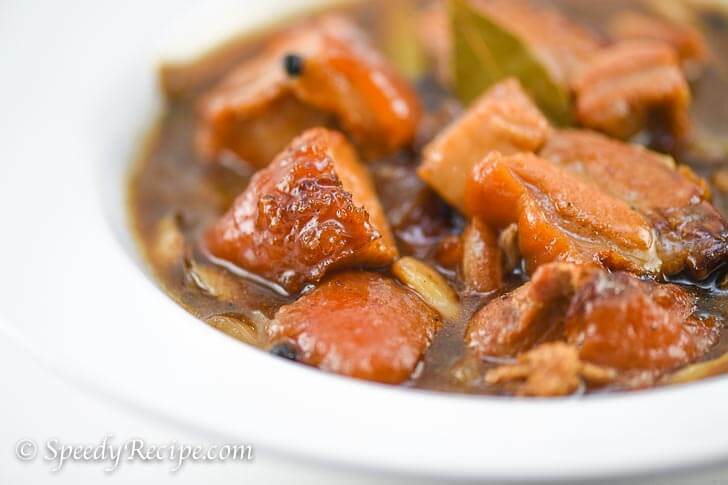 Lechon paksiw is a Filipino pork dish made using leftover lechon or lechon kawali. Lechon refers to spit roasted pig. A whole pig is prepared and skewered in a spit ( a long bamboo rod) and then roasted over charcoal. Lechon kawali, on the other hand, is a crispy pork belly dish wherein a strip of pork belly is boiled and then deep fried until it gets crispy. The leftovers of the two dishes that I mentioned are used to prepare lechon paksiw. The pork is basically sauteed in onion, garlic, bay leaves and peppercorn and the cooked in liver sauce. The sauce is typically served as a dipping sauce, but it is used as a seasoning for this dish. You can use commercial lechon sauce such as mang tomas or you can make your own using this lechon sauce recipe. since the holidays have just passed by, chances are that you might have some leftover lechon sitting in the freezer of inside your fridge. Give your lechon a new life by making lechon paksiw out of it. You will not regret it. This dish is best eaten with rice. It can last for more than a week if kept inside the refrigerator because it contains vinegar, which is an ingredient known to extend the life of food for a few more days. 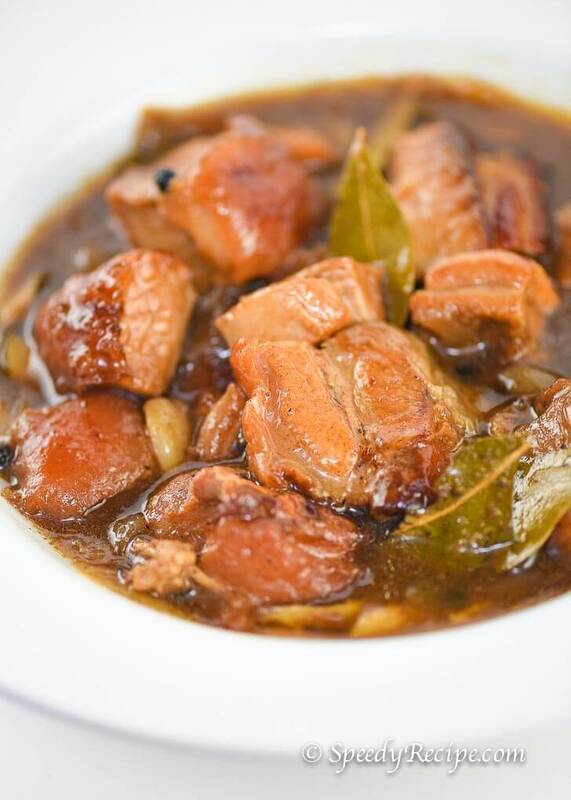 Give this lechon paksiw recipe a try today. Enjoy! This is a recipe for Lechon paksiw. Saute garlic and onion until soft. Add the peppercorns and bay leaves and cook for 2 minutes. Add the lechon. Stir and continue to cook for 2 to 3 minutes. Pour the lechon sauce and beef broth. Let boil. Cover and cook in low heat for 30 minutes or until the liquid reduces in half. Note: add more beef broth or water if the sauce starts to get dry. Pour the vinegar. Let the sauce boil. Stir. Cook for 5 minutes. Add sugar. Sprinkle some salt. Serve with warm white rice. Enjoy! Yummy! I have a huge freezer bag with lechon leftover from New Year. Thanks for the recipe kuya!